Welcome to the first installment of The Jewish Motherhood Project! 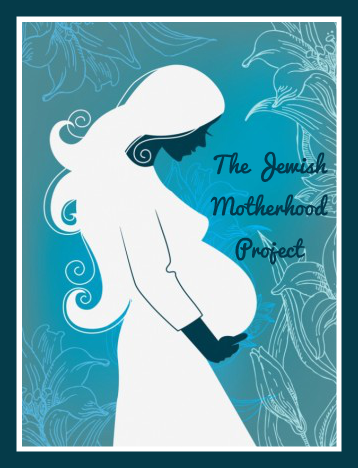 This project/series is geared toward helping all Jewish moms, mums, mommies, imas, emas, and the bajillion of other flavors of mommyhood to discuss the shared experience of pregnancy and birth anonymously or semi-anonymously. To participate, just head on over to the Q&A, and be sure to tune in every week for another installment. For my comments on this Jewish motherhood story, read on through to the bottom. For our first installment, we welcome a 28-year-old mother of one who, at the time of her daughter's birth, had been married for almost two years and was living in Jerusalem. She was not in school at the time, and both her and her husband were working very hard to make ends meet. The entire pregnancy process was quite the ordeal, so please keep reading. I always wanted to be a mom. I did not want to wait as long as we did, however, because of some medical circumstances and a miscarriage, we had our daughter around our second wedding anniversary. Ever since I saw my cousins being born and babies everywhere I couldn't wait to be a mom. I also wanted to do things very differently than how my own mother did so I could not wait. I was very excited when I found out I was pregnant. However, after suffering a miscarriage two months beforehand, I was nervous: I was scared to talk about the pregnancy, scared to be with my husband, and barely left my house until I passed the 12-week mark and was well into the second trimester. It was exciting to know that I was able to conceive again shortly after my miscarriage, and I was excited to know that a human was growing inside of me. How did your husband and family react to you being preggo? My husband was so excited. He loved every second of the pregnancy. My family also was very excited, especially the ones who did not and do not know the measures we went to in order to get pregnant safely the second time around. I had a miscarriage two months prior to conceiving my daughter. It was an early miscarriage, but it was the scariest thing in the world. At the time I was attached to the baby because I happened to have had an ultrasound already, but at the same time it was so small and almost microscopic still that it wasn't as bad to move on as I thought it would be. When I got pregnant again, I was scared to do anything that could potentially hurt my baby. Each ultrasound and blood test was a huge relief and made me happier and more excited than before. Something abnormal about this pregnancy? I was pregnant with triplets! The twins were in one sac and the third baby — my daughter — was in her own sac. The twins sharing a placenta and a sac were in severe danger, and I lost them at 14 weeks. On top of that, I had severe hyperemesis so I had to stay in the hospital for an IV at 11 weeks. On top of the emotions of dealing with possible triplets, the nausea was bad and every time I had an ultrasound everyone would come running to check out the babies. In the end, true emunah saved both my and my daughter's life because those twins may have endangered her safety and health inside the womb. After I lost the twins I had to be very careful. I was on partial bed rest, and we told only our parents the situation. It was hard because on the outside everyone saw me as this cute pregnant girl but we were dealing with so much on the inside that it was very hard. It also took me a while to feel connected to the baby because I felt like I was walking on eggshells for so long. It wasn't until I entered into the third trimester that I started to relax. We only told our family and very close friends about the pregnancy because of everything we have been through. I did not want to post any pictures of my belly on Facebook, so I emailed anything I had to share privately. When we actually gave birth and announced it, people were shocked because they had no idea I was pregnant. I liked it that way. I didn't want to shove my pregnancy in people's faces, giving them room to assume how easy it was, or typical, after everything we have been through. I had to take off a lot of days of work for my illnesses throughout the pregnancy, without revealing why. That was a bit difficult, but at the end of the day, it was worth it. I know some people in my work from outside the office, and I didn't want them knowing my business. I remember sitting with my husband talking about how in a few weeks everything is going to change, and that here would be a baby around us 24/7. It was a weird feeling laying on the couch hanging out knowing that any day a person was going to change our life and things would be different. I was excited and nervous: I was going to meet my baby. I was anxious more about how and when I was going to go into labor than the actual labor itself. I was scared my water was going to break while I was in the store. In the end, the doctor broke it for me, so I am thankful for that. I davened and talked to Gd a lot during the pregnancy, I did not read any specific book, and my labor was very painful. My epidurals did not work so I kind of "forgot" to do some davening while in the process. I did say some tehillim before I went in to deliver, and my husband and I said a special prayer from Tefilas Chanah upon being admitted to the hospital. There are also some special prayers for the husband to say in there, which mine did as we were waiting for admittance. A lot of people are going to tell you different things about raising the baby. Always go with your gut instinct. Refer to books, but know there are so many opinions and ways to do things. Remember and treasure every moment. When I was cleaning out my bedroom a few years ago I found a calendar my mom made of all my milestones when I was a baby. I thought it was ridiculous, no one had looked at it in more than 20 years. But now, being a mom, I want to write everything my baby does down and remember it forever. If your mother-in-law is constantly telling you what to do or not do, just smile and nod, and in her presence do what will make her happy. At the end of the day it's worth it — not making her mad — and when she leaves, you can go right back to doing things your way. Chavi's commentary: This is one seriously triumphant story. You're a strong woman for going through so much, and I can't imagine what a gift your little girl must be to you and your husband. May you both be blessed with as many children as HaShem has in store for you, may they all be healthy, happy, and full of the strength that you hold within! And I'm with you on the baby book thing. My mom kept one for my older brother and me, and that book is like a treasure trove of fascinating milestones like my first words, a piece of hair from my first cut, gifts I got when I was born, and more. Those are things that might not have been meaningful to 10-year-old or 15-year-old me, but at 30, I can tell you I love perusing those goodies. Yes, we moved -- again -- back in September to a new apartment and finally, at last, we rented out our old place after two months of double-paying on rent. The new place accommodates at-home workspace for me and space for the new baby while also giving iBoy his own space, too. The best thing, however, is that it gives us space to have people for Shabbat and to feed them properly, too. Living in the U.S., I was never a super huge fan of Starbucks, mostly because my formative coffee drinking years took place in Nebraska where I frequented a local haunt called The Coffee House (aka Panache), where I'd spend up to eight hours a day studying and doing homework. When Starbucks showed up, we shunned them. But after I left Nebraska, Starbucks was an easy find. I discovered what I liked and didn't, and it was usually easy to find a place to sit for hours on end and soak up the free wireless access. When I moved to Colorado I largely reverted to my local coffee shop hopping, but sometimes the local joints didn't have great wifi, so I was sent packing back to ole reliable where I'd get a Grande Starbucks Doubleshot on Ice (which, at 99 percent of stores, they'll tell you is not an available drink and that there is no button for it, but I know the recipe). All of that being said, I was never a huge fan of their seasonal drinks, mostly because I'm not a huge fan of sweet and milky drinks. At The Coffee House I started my adventures off with the sweetest treats they had like the Crunchy Cricket (a blended ice drink with creme de menthe and coffee beans) and their Irish Mocha (which was very milky and very sweet). But as I progressed through my undergrad and money became more sparse, I realized I couldn't afford those drinks, so I'd buy the cheapest cup of freshly brewed coffee and take advantage of the super cheap refills. I learned to drink my coffee black, and I loved it. These days, I usually take my iced coffee (קפה קר for those of you in Israel) black and my hot coffee with a bit of sugar and milk, but I'm going to attempt to take myself back to my origins with hot, black coffee. But with the weather turning a bit and chatter on the web surrounding all things fall and pumpkins, I've been jonesing for a classic Starbucks treat known as the Pumpkin Spice Latte. I've probably had a handful of them in my life, but for some reason, the canned pumpkin in my cabinet was begging me to turn it into a coffee drink. So I brewed up a strong cup of coffee and got to the pumpkin part. I took 2 Tbls canned pumpkin, 1 cup milk, and 1 Tbls agave and put them in a pan over medium-high heat and brought to a boil. I mixed in a generous dose of nutmeg, coriander, and cinnamon (in the place of pumpkin pie spice), as well as a teaspoon of vanilla. Once it was well mixed with a whisk, I gave it a very hefty hand whisking to bring in some air bubbles (no frother over here). 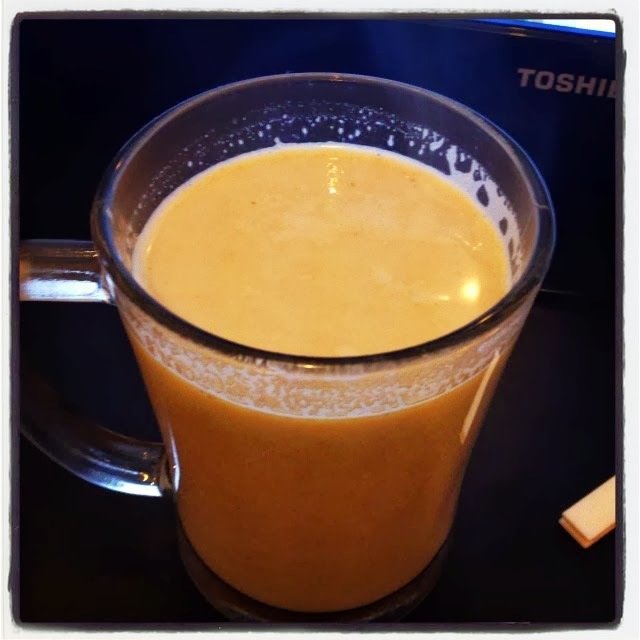 I poured the coffee into my mug and poured the pumpkin/milk mixture in over top and mixed. What at-home coffee concoctions have you come up with to get that fix? This week's Torah portion (aka parshah) is the classic trope for converts the world over: Lech Lecha. At the ripe age of 75 years old, Avram (that's his name before he becomes Avraham) is commanded by G-d to leave home, to go forth from your land and your father's house, from everything you've ever known, to a land that will be revealed. Avram puts the ultimate trust in HaShem to guide him, but not without plenty of bumps and "hold on a second" moments along the way. The promise, HaShem says, is that he will multiply Avram and bless him and his progeny and curse those who curse Avram and his kin. The reason this parshah is so outstanding and emotional for converts is because Avram is, for all intents and purposes, the first willing convert. He hears G-d's calling and says, "Sure, let's do this" willingly and wholeheartedly while holding fast to his nature to battle with G-d over the things that he doesn't understand or agree with (just think about Sodom and Gemorah in Bereshit 18). For me, this portion has always held a near and dear place, because coming from a place where I didn't know or grow up with any Jews, the "calling" (if you can even call it that) came as much from within as from without and the moment I felt it, life changed indescribably forever. At this point in my life, where I think of myself so much less as a convert and more as just another Jew trying to find the right path and living how HaShem wants and needs me to, how do I relate to Lech Lecha? Well, I'm mere days away from my one-year anniversary of aliyah (moving to Israel). Officially, the anniversary is October 16, I can't think of a more appropriate parshah. Like Avram, I felt a calling (for years, folks, since at least 2008) to make Israel my home. I was being called to this land that was a mystery to me, even after frequent visits. The promise of finding a mate and starting a proper family stood waiting for me. So I packed up, left the land of my father, and arrived to the place that HaShem seemed to need me. What happened? I was mated and started "multiplying" almost instantly. The amount of people I know who moved to Israel and got pregnant after some time of trying is equally astounding. 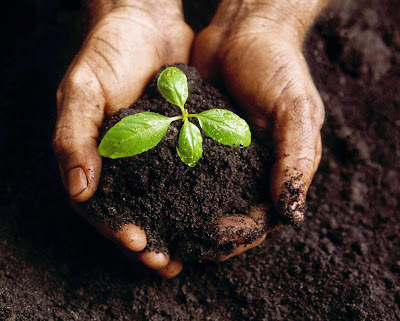 There is something to be said to HaShem's promise to Avraham Avinu (our father), which continues to benefit the Jewish people thousands of years later. Avram might have been the first to leave his comfort, his family, and start anew at the will of G-d, but modern aliyah is a true nod in the direction of the trope of Avram. It's hard, it's complicated, and we all end up screaming and crying in HaShem's general direction because of the roller coaster of emotions, finances, and reality that Israel really does do everything in her power to chew us up and spit us out. But we also learn to appreciate and experience the sense of community and family, the angels in our midst who would bend over backwards to make us feel at home, loved, cared for, and wanted. Aliyah is not for everyone, but then again, not everyone can be an Avram, either. So how do you bring Lech Lecha into your every day life? How do you go forth into the great unknown -- be it personally, emotionally, at work or at home? I inaugurated my new kitchen this week (officially) by baking my first batch of gluten-filled challah for the husband, completely with a shehechiyanu, believe it or not. Jonesing for a pot pie of some variety, I managed to find and execute probably one of the most savory and delicious things I've ever made that would make my simple, Midwestern kin pretty darn proud of me. I timed out the bits and pieces with making the challah, too, and I even came up with a clever way of making the challah in a single pot that relieves my poor KitchenAid from duty. 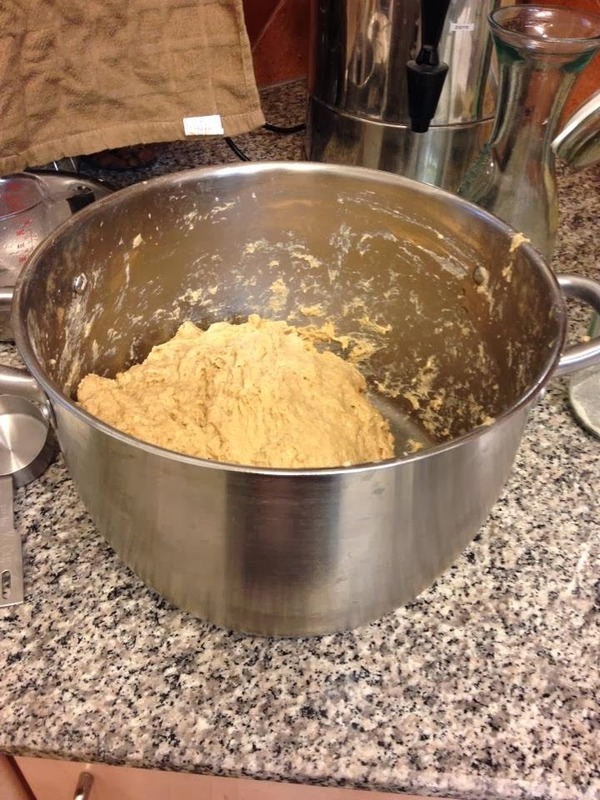 I started with the most giant stewpot that you can find at Ikea, filled it full of 14 cups of flour and all the other ingredients, kneading the entire thing by hand (with gloves, of course ... I might need a face mask next time, too). Leaving it to rise, I tackled the first component of the pot pie: vegan mushroom gravy. When the gravy was done, I punched down the dough and moved on to the second component of the pot pie: the gluten-free almond-based crust. 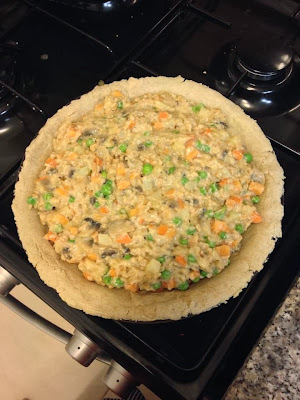 The crust was quick to throw together, so after I put it in the fridge to chill, I moved on to the veggie mixture for the pot pie. I quickly threw together the gravy and veggies, nabbed the dough from the fridge and rolled it out, and put the pie together. Throwing it into the oven, I grabbed the challah and with my brand new huge kitchen counter space, began braiding the dough. For the first time in my life, the challah was braided quickly and ready to rise for the third time while the pot pie finished up. The pot pie came out of the oven, the challah went in, and the husband and I devoured the goodness of a classic comfort food. Mr. T ate probably half the pie, which told me I was doing something right. I don't know how often I'll be making this pot pie, because it was a little time intensive (or maybe it felt that way because I was doing double-duty with the challah), but it was so worth it. The homemade gravy, especially, will come into play in the future whether over mashed potatoes or with my Vegan Veggie Loaf. This week, I'm planning on trying these Buffalo Cauliflower Bites with Vegan Ranch Dressing, Slow Cooker Bean and Spinach Enchiladas, and this trio of delicious smoothies! I'm already thinking about next week's Shabbat menu, and I envision some stuffed peppers and perhaps some vegetarian chili for Friday night since it's been hella cold out here in Neve Daniel over the past week (which I'm loving). The past week was particularly challenging for me, between getting over being horribly sick, preparing for Shabbat, and struggling with the financial reality that we still have not rented out our old apartment meaning our bank account is quite unhappy and my stress levels are super high. By the time Shabbat rolled in, things were tense and all I could think was that those angels were showing up as I lit the candles and they were not happy with what they saw and this week is going to be a mess, right? After lighting I curled up on the couch with the boys off at synagogue and opened up the book I'm reading at the moment, One Baby Step at a Time: Seven Secrets of Jewish Motherhood, and there it was, I was up to the middle of a chapter and a piece called "Winning Shabbat" followed by a chapter called "What We Need to be Happy." Sometimes, HaShem hands us exactly what we need when we need it. 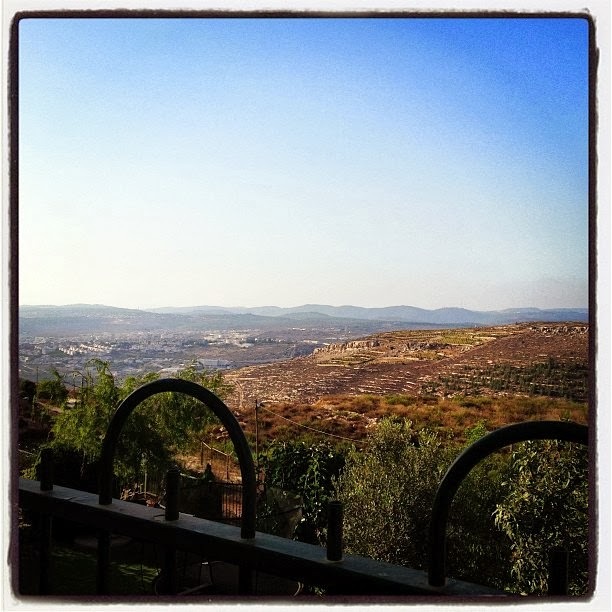 In "Winning Shabbat," the author Chana Weisberg talks about perspective. As I get more pregnant, I think more and more about how this baby is going to arrive and all of the housekeeping and working and being a good wife is going to fall by the wayside and how it's going to grate my "must do everything right and immediately and constantly" nerves. I was born for Jewish mother martyrdom, you see. My default in anything and everything is knowing how to best do anything (after all, I'm a master Googler). "We must decide that the work we do is a teruma, an offering that we give with joy to God, rather than a temura, something that we do for other people with the expectation that we are going to get something in return." It's about overcoming our nature. "It reminds me of how our Sages teach that Sarah was barren for many years because she ahd been born without a womb. And then, when she was ninety years old, after a life of praying and doing good deeds, God rewarded her with a pregnancy -- without a womb!" The gist is that if we learn to overcome our nature, whether it's a tendency toward jealousy or grouchiness, miraculous things can happen (look at Chana, too!). My nature these days is one of "I must do everything" and "Things only get done right when I do them." It's the Jewish mother martyrdom nature that I really, really have to learn to step back from. After an amazing dinner out with friends, things got calmer, things were talked out, I shared the chapters I'd been reading with Mr. T, and the tension that Shabbat came in with dissipated. Reading over the essays in the next chapter about finding happiness and figuring out what we (mommies, women in general) to get everything done but still have our special, happy place. "The greatest gift we can give our families (and ourselves) is a mother who is thriving physically, spiritually, and emotionally." So I've been thinking. What do (or will) I need to stay sane and happy so I can be the best Jewish woman possible and the best mother possible? The author talks about needing a few hours to spend on Torah a week, to not make cooked dinners every night of the week, and to have a cleaning lady once a week. The funny thing is, her needs greatly resemble mine. Last week I kept telling myself "You're going to sit down with the weekly Torah portion, learn it, devour it, and blog about it like you used to." When I was living in Washington DC and Chicago back in 2006-07, I devoted my late-night, post-Washington Post work nights to a coffee shop and the weekly parshah. It fulfilled me, it kept me feeling academically minded while I wasn't in school, and it gave me perspective on my Jewishness on a weekly basis. When I was in grad school in Connecticut, I had tons of Jewish learning happening all the time, because I was both in grad school and working on my Orthodox conversion. When I hit NYU and life started crumbling, I still had my classes, I still had Jewish thinking and learning, and felt like I was giving back to myself but also fulfilling a major happiness need. Since then, it's been tough. I've been trying to figure out what it is that I need to be happy, while also being a stellar wife and future mama. As I figure out what I need to be happy (scheduled blogging time, an evening of pleasure cooking, once a week in a coffee shop working, and so on), I'm curious what those of you out there -- whether you're a hard-working woman trying to find time for yourself or a mother of many who can't seem to find a moment to herself -- need to be happy. Have you even thought about it? "Grow where you are planted." Recognize that the life you have is not arbitrary, but orchestrated from above and hence is, at this moment, the context to which you must bring your finest efforts.